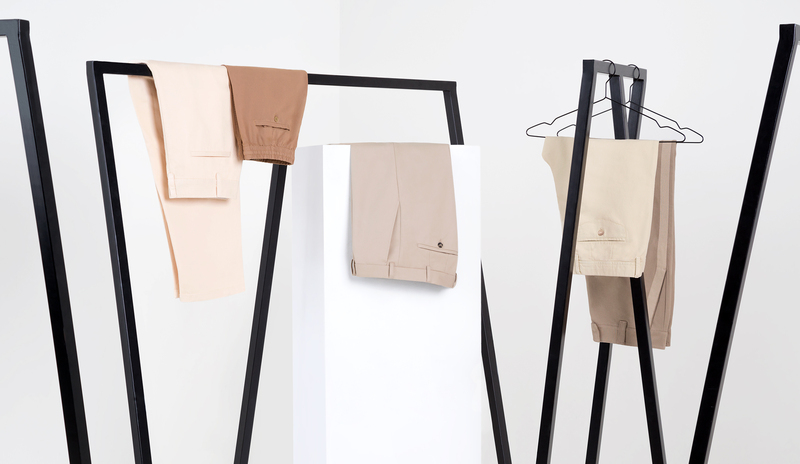 Chinos are lightweight summer trousers that are generally made from cotton. They come in a casual fit which is tight at the ankles, suits almost every type of shoe and looks great with classic T-shirts and long-sleeved tops. These trousers are a genuine all-rounder: they work well with trainers during the day, while in the evenings they will be perfect for smart-casual events. Slim fit trousers are narrower than classic regular fit designs and are characterised by a body-conscious cut and fabrics with high elasticity. Models containing 2-3% elastane should keep their shape even when worn many times. Tracksuit bottoms have long ceased to be seen purely as sportswear: for years, designer brands have been creating models made of high-quality fabrics as casual garments. These trousers are characterised by a wide-cut and tight cuffs at the hemlines. Cargo pants are characterised by a straight, casual cut and are generally worn in summer. Their unique feature is a pair of pockets on the outside of the legs which are usually fastened with buckles, Velcro straps or snaps. They are a popular garment for recreational outdoor activities and give any outfit a sporty look. On hot summer days, shorts are a popular alternative to long trousers. They are a real all-rounder and can be worn with both casual espadrille-style shoes and sporty trainers. Always pay attention to the length of shorts when buying them: it should end at the knees without covering them completely. However, if the knees are concealed, you can simply roll up the trouser legs (or try a smaller size).